Abstract: Even though almost 30% of the general population presents a persistent foramen ovale (PFO) the paradoxical embolism is a rare fi nding (2% of arterial emboli) and the thrombus is rarely caught passing through the PFO. Diagnostic imaging remains the cornerstone for accurate diagnosis of a thrombus-in-transit, especially using transesophageal echocardi-ography (TEE) with a high specificity. There is a lack of evidence-based recommendations for the management. We report a 38-year-old female with an intermediate-low risk pulmonary embolism (PE). An entrapped thrombus across a PFO was revealed by TEE. Subsequent imaging has shown a splenic infarction thus confi rming the diagnostic of paradoxical embolism. The main factor that led to right to left shunt through PFO was the irritating cough provoking a Valsalva maneuver. She underwent early surgical thrombectomy with PFO closure. Thrombus-in-transit remains a rare entity and an effective option of management is early surgical embolectomy. Further studies need to be done in order to establish the best management strategies. First described in echocardiography in 19851, a para-doxical embolism is a rare finding (2% of arterial em-boli) and the diagnosis is largely presumptive based on the demonstration of a right-to-left shun and evidence arterial embolism associated with venous thrombus or pulmonary embolism (PE)2. Definite demonstration of a thrombus crossing a persistent foramen ovale (PFO) is a rare finding3,4,5 although it may be underestimated due to lack of routine echocardiography. The situation is life threatening but the treatment of choice is still controversial6,7. A 38 year-old non-smoking woman was referred to our emergency department with a 2-week his-tory of progressive exertion dyspnoea, pleuritic inter-scapular pain, irritating cough and left limb pain. Her only medication included oral contraceptive pills. On examination, she was mildly tachycardic (100 beats/min) but hemodynamically stable (BP 115/82) with only minimal respiratory distress at rest (oxygen saturation 93% on room air). The physical examinati-on was normal. Blood tests revealed elevated inflammatory mar-kers: white blood cells: 17000/mm3, C-reactive prote-in of 237 mg/l. Arterial blood gas analysis at room air revealed an oxygen partial pressure of 73 mmHg for a pH of 7.44, paCO2 29 mmHg. Cardiac biomarkers were in the normal range. 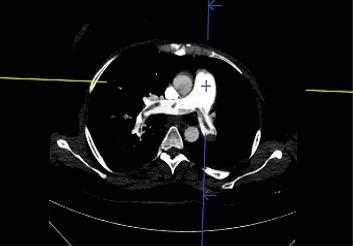 Computer tomographic (CT) pulmonary angiogra-phy was requested and confirmed the presence of proximal bilateral pulmonary emboli (Figure 1). Bedside FoCUS transthoracic echocardiography (TTE) was then rapidly performed to assess right heart involvement. Unexpectedly, FoCUS TTE reve-aled a wormlike floating mass which seemed attached to the right atria septum in the vicinity of the proximal superior cava, deeply extending into the right ventri-cle across the tricuspid valve. There were no signs of right ventricular dysfunction, but only mild tricuspid regurgitation with right ventricular systolic pressure of about 30 mm Hg. Heparin treatment was initiated and the patient was transferred to our Intensive Care Unit for monitoring. The subsequent comprehensive radiologic exami-nation revealed on lower abdominal CT images a small filling defect in the splenic artery compatible with an embolus. In the light of this finding, we rapidly decided to per-form a transoesophageal echocardiography (TEE) whi-ch showed a large, mobile thrombus, extending from the right ventricle towards the right atrium across the tricuspid valve then passing through a PFO into the left atrium (Figure 2, Video 1). Subsequent lower limb Doppler ultrasonography also detected deep vein thromboses into the left femoral and popliteal veins. The patient was immediately referred to a cardiac surgical centre for surgical intervention. Fresh throm-bemboli in bilateral pulmonary arteries and both atria were removed, the PFO was closed by direct suture and an inferior cava filter was placed. Conventional anticoagulant therapy was initiated, and the patient re-covered uneventfully one week later. Figure 1. Computer tomographic (CT) pulmonary angiography shows the presence of proximal bilateral pulmonary emboli. Figure 2. Transesophageal echocardiography in high esophageal position shows a large thrombus entrapped in patent foramen ovale with its exten-sions in right and left atrium. Transient right-to-left shunt can occur with cough, vomiting, Valsalva, explaining how an in-transit throm-bus can be entrapped in a PFO even in the setting of normal pressure relationships in rest8. We hereby hypothesize that in our patient the entrapment was provoked by temporarily raised pressure in the setting of an irritating cough. Performing routine TTE in patients with PE and a low PESI score is not considered necessary at present9. In our patient, FoCUS TTE has been rapidly performed before calculation of the clinical severity index, but had it not been carried out, this serious condition would have been missed. Right heart thrombi are still regarded as a signifi cant predictor of poor prognosis in PE10. However right heart thrombi in PE were occasionally described even in patients without markers of myocardial injury or right ventricular dysfunction11,12, as was the case of our patient. Clinical features leading to the correct diagnosis of entrapped embolus can be misleading. While a few pa-tients presents with a classical diagnosis of PE and pa-radoxical embolism, the majority of patients presents with a PE diagnosis alone and up to 7% present with paradoxical embolism diagnosis alone13. All these findings taken together lend support to the rather systematically use of TTE in patients diag-nosed with PE. In our patient, the presence of systemic embolus at the time of the initial CT study for PE strongly supports the fact that right atrial thrombus was already traver-sing the PFO by the time the bedside FoCUS TTE was carried out, but unfortunately was not noticed . This points out the inherent limitations of FoCUS echo-cardiography usually performed in the Emergency de-partment, endorsing the viewpoint according to which referral for TTE examination is mandatory as soon as possible in all cases with abnormal findings on FoCUS TTE14. In a review published by Aboyans, systematic TTE suggested the diagnosis in only 80% (35/44) of pati-ents with entrapped thrombus through PFO13. In the largest systematic review reported so far since 1991, the diagnosis was suspected in only 145 patients from 166 patients initially undergoing TTE7. There are also several other cases reported in which TTE incomple-tely detected only the right15,16 or only the left side3,17 component of an actually straddling thrombus across a PFO. Finally, TEE permitted accurate diagnosis in all this instances. These findings suggest the necessity of systema-tically and rapidly proceeding with TEE in the setting of any right heart thrombus suspected by TTE or CT angiography, even in patients with no clinical suspicion of paradoxical embolism. Given the rather mediocre diagnostic yield of TTE in this rather severe condition, it can be argued that a TEE should be rather systematically performed in every patient with PE and/or paradoxical embo-lism. However, the very low incidence of right heart thrombus pleads against this cumbersome strategy. Nevertheless, a strategy involving the systematic use of FocUS TTE in low-Score PESI patient with PE and more awareness to the right heart pathology during the initial CT study for PE may offer a cost and time effective option enabling to screen at-risk patients. No randomized trial has been conducted to compa-re treatment options in these patients. In patients with PE and right heart thrombi, Rose reported a better survival rate when comparing thrombolysis to either anticoagulation or surgery18. There is a theoretical threat of left sided fragmented embolisation during antithrombotic treatment in the setting of thrombus traversing into left heart cavities. Some systematic re-trospective reviews showed that surgery was associ-ated with fewer post-treatment embolic events and a lower mortality compared with thrombolysis or anti-coagulation therapy6,7. Surgery is therefore preferred in patients witch a thrombus straddling a PFO and in this situation it must be done without delay. However, in patients hemodi-namically instable or having important comorbidities (stroke, progressive cancer, friability), thrombolysis or anticoagulation are equally acceptable therapeutic alternatives7. The safety of the TEE has been established in large series of patients19. However, little experience exists in using TEE in patients with right heart entrapped or free-moving thrombus due to the rarity of this conditi-on. To the best of our knowledge only two cases were reported with a right atrial mass dislodged during TEE and causing massive PE20,21. This should incite to ca-ution when performing urgent TEE in such patients. When the diagnosis of thrombus entrapped in a FOP can be clearly established by TTE, time-consuming TEE should be probably avoided. 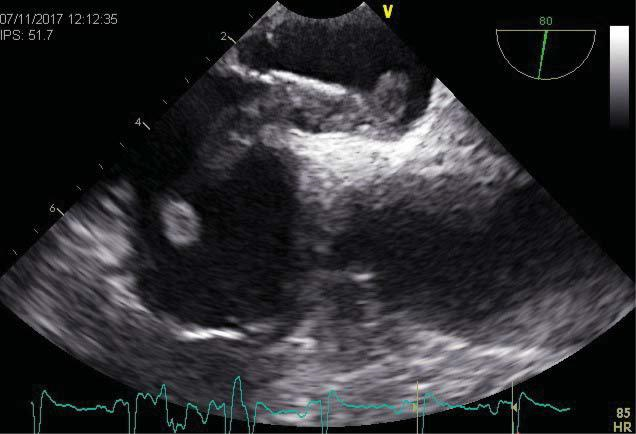 This case illustrates the role of different echocardi-ographic modalities, their advantages and equally their limits in detecting and managing a rare but serious condition requiring urgent intervention. Conflict of interest: non declared. 1. Nellessen U, Daniel W, Matheus G, Matheis G, Oelert H, Depping K, Lichtlen PR. Impending paradoxical embolism from atrial throm-bus: correct diagnosis by transoesophageal echocardiography and prevention by surgery. J Am Coll Cardiol 1985; 5:1002-4. 2. Doyen D, Castellani M, Moceri P, Chiche O, Lazdunski R, Bertora D, Cerboni P, Chaussade C, Ferrari E. Patent foramen ovale and stroke in intermediate-risk pulmonary embolism. Chest 2014;146(4):967-73. 3. Desai R, Ayub B, Martinez MW. Paradoxical embolism interrupted. Heart Lung Circ 2014; 23(2):197-8. 4. Meimoun P, Mesnildray P, Clerc J, Luycx-Bore A, Boulanger J. Volu-minous thrombus straddling the patent foramen oval in the setting of massive pulmonary embolism, treated successfully by surgery. Ann Cardiol Angeiol 2016;65(5):363-5. 5. Petris AO, Stoica L. An entrapped in fl agranti thrombus. J Thromb Thrombolysis 2016; 41 (4):684-5. 6. Myers PO, Bounameaux H, Panos A, Lerch R, Kalangos A. Impending paradoxical embolism: systematic review of prognostic factors and treatment. Chest 2010; 137:164-70. 7. Seo WW, Kim SE, Park MS, Lee JH, Park DG, Han KR, Oh DJ. Sys-tematic Review of Treatment for Trapped Thrombus in Patent Fora-men Ovale. Korean Circ J 2017; 47(5):776-85. 8. Hansen A, Kuecherer H. Caught in the act: entrapped embolus through a patent foramen ovale. Eur J Echocardiogr 2008; 9(5):692-3. 9. Konstantinides SV, Torbicki A, Agnelli G, Danchin N, Fitzmaurice D, Galiè N,Gibbs JS, Huisman MV, Humbert M, Kucher N, Lang I, Lankeit M, Lekakis J, Maack C,Mayer E, Meneveau N, Perrier A, Pruszczyk P, Rasmussen LH, Schindler TH, Svitil P, Vonk Noorde-graaf A, Zamorano JL, Zompatori M. ESC guidelines on the diagnosis and management of acute pulmonary embolism. Eur Heart J 2014; 35(43):3033-69. 10. Koć M, Kostrubiec M, Elikowski W, Meneveau N, Lankeit M, Gri-foni S, Kuch-Wocial A, Petris A, Zaborska B, Stefanovi B, Hugues T, Torbicki A. Outcome of patients with right heart thrombi: the Right Heart Thrombi European Registry. Eur Respir J 2016;47(3): 869–75. 11. Bedeir K. Thrombus in Transit with Isolated Paradoxical Embolism to the Subclavian Artery. J Stroke Cerebrovasc Dis 2015;24(7):e173-5. 12. Ozdogru I, Kaya MG, Dogan A, Inanc T, Yalcin A, Oguzhan A. Thrombus crossing through a patent foramen ovale. Int J Cardiol 2009;133(2):e55-6. 13. Aboyans V, Lacroix P, Ostyn E, Cornu E, Laskar M. Diagnosis and management of entrapped embolus through a patent foramen ovale. Eur J Cardiothorac Surg 1998; 14(6):624-8. 14. Neskovic AN, Edvardsen T, Galderisi M, Garbi M, Gullace G, Jurcut R, Dalen H, Hagendorff A, Lancellotti P. E Focus cardiac ultrasound: the European Association of Cardiovascular Imaging viewpoint. Eur Heart J Cardiovasc Imaging 2014; 15(9):956-60. 15. Podroužková H, Horváth V, Hlinomaz O, Bedan J, Bambuch M, Němec P, Orban M. Embolus entrapped in patent foramen ovale: im-pending paradoxical embolism. Ann Thorac Surg. 2014;98(6):e151-2. 16. Pappas AJ, Knight SW, McLean KZ, Bork S, Kurz MC, Sawyer KN. Thrombus-in-Transit: A Case for a Multidisciplinary Hospital-Based Pulmonary Embolism System of Care. J Emerg Med 2016;51(3):298-302. 17. Turfan M, Vatankulu MA, Murat SN, Oksuz F, Duran M, Ornek E. Thrombolytic treatment of simultaneous pulmonary embolism and impending paradoxical embolism through a patent foramen ovale: a different thrombolytic regimen. Heart Lung Circ 2012;21(4):225-8. 18. Rose PS, Punjabi NM, Pearse DB. Treatment of right heart thrombo-emboli. Chest 2002; 121:806-14. 19. Hilberath JN, Oakes DA, Shernan SK, Bulwer BE, D’Ambra MN Elt-zschig HK. Safety of transesophageal echocardiography. J Am Soc Echocardiogr 2010; 23(11):1115-27. 20. Cavero MA, Cristóbal C, González M, Gallego JC, Oteo JF, Artaza M. Fatal pulmonary embolization of a righ atrial mass during trans-esophageal echocardiography. J Am Soc Echocardiogr 1998; 11: 397-8. 21. Kim JH, Kim YJ. Thrombus in Transit within a Patent Foramen Ova-le: gone with the Cough! J Cardiovasc Ultrasound 2011; 19(4):196-8.